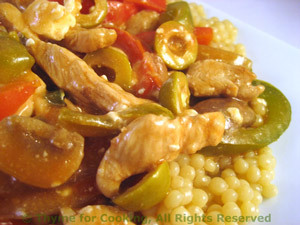 Turkey with Peppers, Olives and Feta, Thyme for Cooking easy main course. The Mediterranean flavors of peppers, olives and feta make bland turkey special. Serve over Toasted Couscous, Basmati Rice or Barley. Use more or less feta, according to taste. Cut the peppers into strips. Trim and slice the mushrooms. Slice the olives into thirds. Cut the turkey into strips - bite-size. Heat olive oil in large nonstick skillet over medium-high heat. Add onion, peppers to skillet and stir-fry for 4 minutes. Add garlic, mushrooms and stir-fry another 4 minutes. Add turkey and stir-fry 3 - 5 minutes, until golden. Add chicken stock, sherry, tomato paste and bring to a boil. Dissolve cornstarch in water. Add to skillet and stir until thickened. Add olives, feta and stir, just until the feta starts to melt. Remove from heat and serve over couscous. Bring chicken stock and couscous to a boil in a small saucepan. Cover and cook 10 minutes. Uncover and drain any excess liquid.